This morning’s broadcast began with a map showing over a dozen countries where anti-American protests have been held in the past week, some leading to American deaths, ostensibly sparked by an anti-Muslim video posted on YouTube. US Ambassador to the United Nations Susan Rice said, “This is a spontaneous reaction to a video,” and she could not predict how much longer it would go on. Rice said the demonstrations in Benghazi, which lead to the death of the US ambassador and three other American, began spontaneously but then “opportunistic extremist elements” used this protest to escalate the violence. 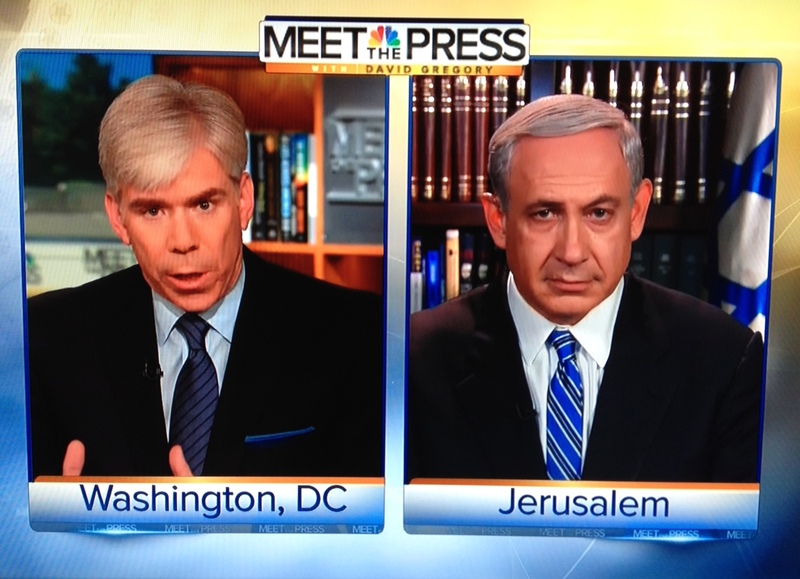 Host David Gregory asked about calls to suspend foreign aid to Libya and Egypt. Rice says we give that aid because it serves American interests, and the governments there are providing security to our facilities. Rice added that the US and the world are mounting unprecedented pressure on Iran. The sanctions are crippling, and there is time and space for this pressure, according to Rice. She made that case that when President Obama came to office, the international community was divided over Iran and Iran was very united internally. Today,she says the opposite is true. We have greater international unity on Iran, and Iran’s society is fractured. She repeated that the US does not have a “policy of containment” regarding Iran. Next up was that interview with Prime Minister Netanyahu. He said that President Obama has consistently said that Israel has the right to defend itself. “President Obama has said that he is determined to prevent Iran from getting nuclear weapons, and I appreciate that,” Netanyahu added. Then, showing a firm belief that world events revolve around the magnetic pole of US presidential campaigns, Gregory tries again to ask about the American elections. Netanyahu again resists. Netanyahu called the anti-Muslim video “reprehensible and irresponsible,” and said it was only a “spark.” Instead we should focus, he said, on the extremist groups against all the things we value. “The very existence of the United States, its values, and by extension Israel, they view as an intolerable crime,” Netanyahu concluded. In the roundtable, I was happy to hear Jeff Goldberg of The Atlantic lead off by warning that seven weeks from an election, there is a tendency to turn everything that happens in the world into an election issue. In reaction to so-called apologies for the anti-Muslim video, Goldberg said we have to remember, “There is a perpetual grievance machine in the Middle East.” People will be angry no matter what, so we need to explain our support for free speech and explain that we will not give up on this. Goldberg also said. “I have never seen an Israeli prime minister mismanage the relationship with the United States or with a president the way this one has.” King vehemently disagreed. When asked if he would “double down” on Republican presidential nominee Mitt Romney’s statement that President Obama has “thrown Israel under the bus,” King said, “Yes.” Congressman Keith Ellison (D-MN) said this should not be a “political football” in an election year.